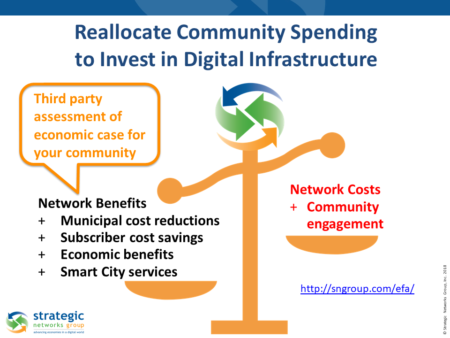 A Digital Infrastructure Strategy for Communities and Regions | Strategic Networks Group, Inc.
Communities and regions that invest in broadband networks do so because they understand that it is essential digital infrastructure for their future. 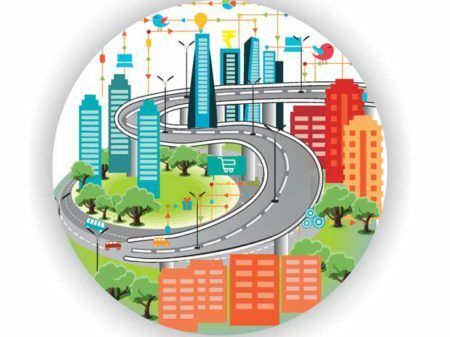 Localities that do not have digital infrastructure face population and business losses (declining tax base), higher costs in providing civic services, and significantly hinder business attraction limiting economic growth. These benefits are what we at SNG call the ‘demand side’ of broadband, digital infrastructure, and transformation because they are the drivers for technology investments – such as a municipality saving 86% in telecommunication and internet costs. SNG is agnostic to technology and network business models which are the ‘supply side’ of broadband. We focus on the ‘demand side‘ of broadband and our mission is to help communities and regions get the best value for their ratepayers from technology investments and to help them maximize sustainable economic development opportunities in an increasingly digital world. Moving Forward – What is Needed? 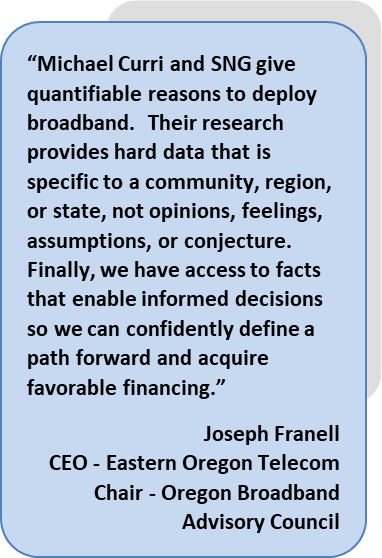 Assessing the economic feasibility up-front of whether community benefits outweigh the costs of investing in broadband and digital infrastructure provides local leaders with the data points needed to select the right operating and business model needed to addresses the community’s current and future needs. Choosing the right business model is critical to ensuring that the resulting business plan is on target, low risk, and economically sustainable to achieve the community’s goals. 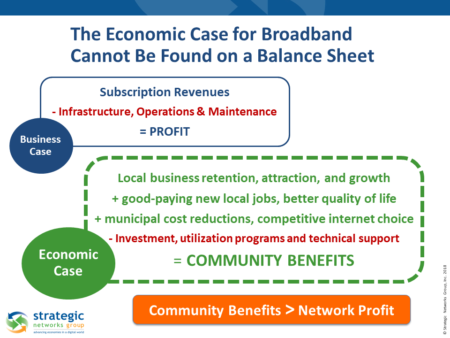 Local leaders must identify the optimal business and operating model for a broadband deployment before preparing a business plan. A retail business model is one option, but there are other options such as a digital infrastructure approach with Broadband Improvement Districts that do not require the community to take on debt, nor raise taxes. The locality is not directly competing with commercial retail ISPs. Multiple retail service providers can access residential and commercial subscribers over the digital infrastructure built and operated by the community. Just like road infrastructure, competition is enabled by an open-access network. The network can be self-financed through municipal cost reductions and smart community services without the community taking on unsustainable debt or raising taxes. The network is built to committed demand thereby eliminating financial risk to the community ensuring the network is sustainable when it begins providing service. Allows the community to leverage its core strengths in providing infrastructure, rather than operating as a retail business. Stage 1 – Establish a core network across the community that serves municipal buildings and key anchor institutions. The core network has the potential to be self-financed through Internet and telecommunication cost reductions enabled by the community constructing, owning, and operating its own digital infrastructure. Further cost reductions and new municipal revenues are possible through smart community services, with accompanying improvements in services. Therefore, the core network stage should also include one or two smart community initiatives that provide immediate and tangible benefits to the community and to community operations. Smart community services for parking, waste management, etc. offer community benefits and new revenues, but also start digital transformation with the community. They demonstrate to the community that the investment in a locally-owned fiber network is not only about providing internet connectivity, but is intended as a platform for long-term community benefits and sustainability. Stage 2 – Expand the network infrastructure community-wide using a Broadband Improvement District model. Once the core network is in place, providing essential facilities strategically located throughout the community, the network can be extended into neighborhoods based on committed demand from property owners which ensures sustainability. Broadband Improvement Districts (also known as local or business improvement districts) are boundaries determined by the local government where the broadband access network is proposed to be built and property owners have the opportunity at the beginning of the process to pay for connecting to the network by attaching the cost over 15-20 years to their property. SNG sees this as the path forward to connecting last mile for unserved and underserved areas without raising taxes, or taking on unsustainable debt. A BID is a contiguous area determined by the community representing a relatively homogeneous market demand for broadband within each neighborhood to be targeted to provide fiber access to the households and businesses. Multiple retail ISPs are invited to provide services to households and businesses over the locally-owned infrastructure. The ISPs gain access to new customers without any capital (network) investment and offer services at competitive rates. Property owners will be given the opportunity to opt into the BID by committing to an up-front payment that can be financed at affordable rates. Property owners who do not opt in are not required to pay anything, either directly nor through local taxes. The BID network investment is not made until there is sufficient committed demand within the BID area to ensure sustainability. BID network connection costs, financed as a monthly payment. Monthly network operating cost, typically added to the monthly utility bill. Monthly fee for internet services, paid to the retail ISP they select. The total monthly cost to the property owner is typically less than they would pay for current commercially available Internet service, and with much higher speeds. Property owners can easily switch between retail providers at any time enabling competition which lowers pricing,increases features, and improves service. The exact boundaries of BIDs are to be determined at a later planning stage. However, this will be done in such a way that there is a reasonable expectation that a sufficient number of property owners will opt in, thus self-financing making the BID investment sustainable from the moment it provides the connection. Broadband Improvements Districts can use any relevant and applicable technology that will serve not only current needs, but also future needs – which SNG defines as potential demand. operating the network. Most communities do not have the capacity nor experience to build, operate, or provide services over a network. SNG recommends communities maintain ownership of the infrastructure so they can own their digital future. Include in the capital financing of the network 10% for marketing, community engagement, and performance reporting – this will drive digital transformation across the community, which in turn drives service sustainability, local economic growth, and community benefits. With market analytics and data on community impacts, elected officials and economic development professionals can identify evolving community needs, implement smart community services assessed to have the biggest impact on the community, and show community return on investment (ROI) in terms of business retention and growth, GDP and tax base impacts, quality of life benefits, etc. This is a process that is cost effective and critical for success. The drivers of this process are economic and community benefits. When these drivers outweigh the costs of broadband and digital infrastructure they become the foundation for investment. 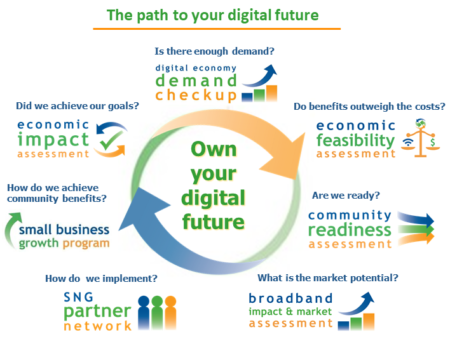 This has often been missing in the process and that is why SNG strongly recommends starting with assessing community benefits and the economic feasibility before investing in broadband and digital infrastructure. Committed demand is the level of sign-ups by local property owners to join the new open access network. See video of the improvement district approach used in Ammon, Idaho.